This memorial trophy is awarded each season to a swimmer who has accomplished the highest achievement from within the Club whether it be at regional, state, national or international level. 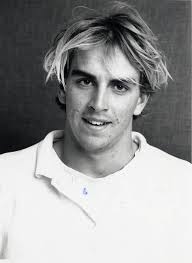 Adam Neville was one of New South Wales most respected young swimmers and surf lifesavers who died suddenly in October 2001, aged 24. Adam was born in Gosford, NSW to John and Cheryl and his family eventually moved to Coffs Harbour where his parents leased the Coffs Harbour War Memorial Olympic pool from 1980 until 2004. As a youngster Adam was surrounded by water. Always at the pool and always near the surf. A talented young swimmer, Adam became a NSW State finalist in breaststroke and also took to the surf, representing Coffs Harbour and the NSW North Coast in the NSW Country Swimming and Surf Life Saving Championships. Adam and his sisters Peta and Belinda were also members of the Coffs Harbour Swimming Club. For 16 years between 1982 and 1998 Adam created and surpassed 46 Swimming Club records. Most notably in 1984 at 6 years of age Adam created the 50m breaststroke record in under the minute. A feat one of many that has never been broken. Adam also pursued his love of the surf, following in the family footsteps of his uncles Alan, Len and Jon Cook, gaining his bronze medallion and becoming a budding surf swimmer, iron man and board paddler - which became his passion. At Coffs Harbour he represented at the NSW and Australian Championships, winning many board rescue titles with his partner Jamie Mitchell and training under legendary surf coach John Mills. He joined the Currumbin Vikings on the Gold Coast and went on to become a prominent board paddler in the club's Queensland and Australian Championship board relay, taplin relay and board rescue teams. Adam suffered the loss of his father John, in 1999 and returned to Coffs Harbour to assist his mother Cheryl with the family business at the Coffs Harbour Memorial Pool. He always had a love of horses and breeding and was always willing to provide his expert tips to anyone who would listen, burying his nose in the form guide every Friday and Saturday. Adam was also a fanatical South Sydney Rabbitohs fan, who followed the famous club through thick and thin. Adam continued to compete for his beloved Currumbin Club and enjoying the company of his many friends at North Burleigh and also remaining loyal to Coffs Harbour, always lending a helping hand. Adam was ready to further his career in accounting at Griffith University when he would return to the Gold Coast in 2002. Adam was all set to attend the 21st birthday of his cousin Troy Hanson at Currumbin on the fateful day he lost his life to a genetic heart defect which had never been diagnosed. The day he arrived back on the Gold Coast Adam went for a surf and a paddle at North Burleigh, and also catching up with all his mates. Several who had also befriended him in his days at Coffs Harbour and had also moved to the Gold Coast. Adam returned to his house and collapsed, his mates trying in vain to revive him. It was a heart-breaking time for his family, his friends and the community who had come to love and admire a young man who had the world at his feet and who would bring a smile to the faces of all who knew him. He was a quiet, fun-loving, unassuming young man who had a passion for life, swimming, surf lifesaving, the horses and his family and friends. Recognition of his sporting talents have continued to the present with the annual Adam Neville Memorial AFL showdown between the Currumbin Vikings and North Burleigh Surf Clubs, the Adam Neville Memorial at the Coffs Harbour Surf Club and the Adam Neville Memorial Award at the Coffs Harbour Swimming Club. Adam Neville, gone too early at the age of 24, but never forgotten by his family and friends.